We will be putting a new photograph up shortly showing the popguns we can now receive from our supplier. In order to comply with Federal laws governing toy guns that are trying to make toys obviously toys, our popguns now come with a red plastic "cork." 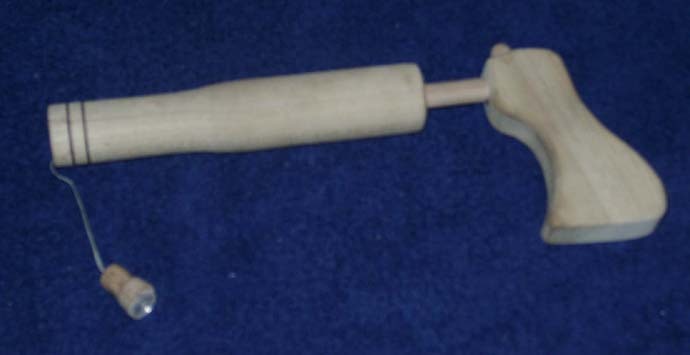 As far as the history of popguns is concerned, the popgun piston design comes from several almost identical boys' activity books. The sample included here is from The American Boy's Book of Sports and Games. The existence of the string to hold on to the cork is not mentioned but we consider it highly likely to help the boy avoid losing the cork. Of course, if the boy wanted the cork to have longer range, the string could be cut or dispensed with altogether. We have retained the string to guard against loss and also as a safety feature to limit the range of the popgun.